I'm a messy, disorganised person. I was meant to do Christmas in July baking, and before I knew it we were already in August. I planned all sorts of baking for Halloween, and *whoosh*, that passed by in a flash. I was determined, crazy determined to be more organised for Christmas. I kinda love Christmas. I'm not religious, and my family haven't done Christmas presents since we were little, but I love the warm family joy that the holiday season brings, and all the indulgent eating that I associate with it. Back in Malaysia, Mum always cooks a turkey and Dad carves it. Here in Sydney, I've been lucky enough to be included in A's family Christmases, which are different but kind of the same. And once again I seem to be leaving my Christmas shopping until the very last minute. But at least I've gotten off my lazy bum and started my Christmas baking! So since I'm a messy, disorganised baker, I decided to start with something simple and make it even simpler. I love gingerbread houses, and gingerbread in general. Gingerbread houses always make me think of reading Enid Blyton books when I was young, about the Land of Candy in the Faraway Tree series, with the chocolate lamp poles and peppermint grass. Part of the fun of gingerbread houses is running around the lolly aisle in the supermarket, trying to figure out what you can use to construct/decorate your house. 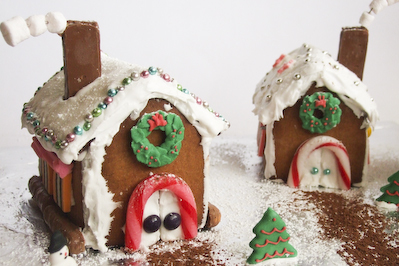 These little gingerbread houses are perfect to make with the kids. The gingerbread recipe is a simple recipe I use for gingerbread men, it is really easy to roll out and cut. My favourite thing about the recipe is that it uses up all egg-whites and yolks, so you don't have any random egg bits leftover. And since these are very basic, baby-sized houses, you don't have to worry about any complicated templates or construction. I just used a metal ruler and a sharp knife to figure out the shapes I needed for my house (after testing it with some cardboard first). The best thing is you get lots of little houses out of the dough, so you can decorate each of them however you want, and you don't need to be super neat or precise about any of it. Unfortunately I picked a sweaty hot day to make these (right before a big bout of cold weather hit Sydney), so I was cranky and in a rush to get them done. By the end of it, I was just slopping royal icing on everything, so they aren't the prettiest looking gingerbread houses I could have come up with. But the fact that I could put these together so easily and with so little effort shows what a great afternoon project they would be for anyone. Any now they are sitting prettily in my living room, making the whole place smell lovely. I don't think I have the heart to eat them! Whatever you want! I used mini marshmallows, licorice allsorts, mush sticks, mini candy canes, Chomp bars, malt sticks, mini skittles, peppermints and multi-coloured cachous. Whisk flour, bicarb, ginger and cinnamon in a separate bowl and stir to combine. 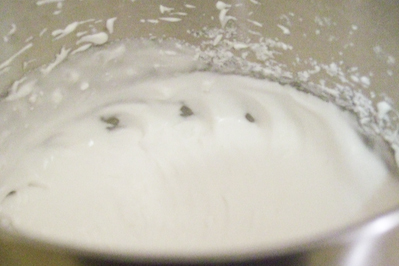 Preheat oven to 180 degrees C. Cream butter and sugar in a large mixing bowl until light and fluffy. Continue beating, adding one egg yolk at a time until well combined. Add dry ingredients and golden syrup and stir together until it starts to come together. Use your hands to combine and knead into a smooth dough. 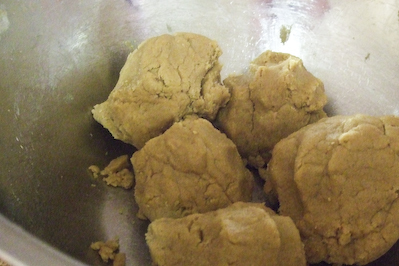 It will be quite a crumbly mixture, but don't worry, it will moisten up when it is rolled out. 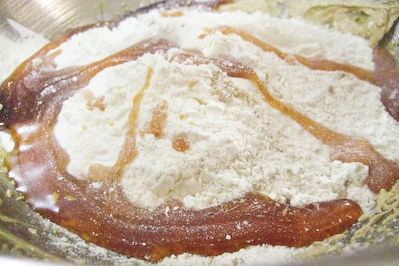 If the mixture is too sticky for your liking, lightly dust with flour and knead a bit more. Split the dough into 4-5 balls. Take one of the dough balls and place on a sheet of greaseproof paper that has been lightly dusted with flour. Place another sheet of greaseproof paper on top and roll the dough between the sheets of paper using a rolling pin to a thickness of about 4-5 mm. - 2 front walls: 5cm x 5cm squares with an isosceles triangle connected on top with a height of 3cm (see photo below), i.e. 5cm sides with a 8cm point down the middle. 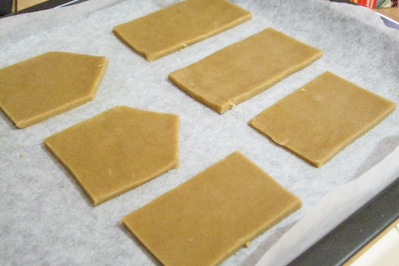 Lay the cutouts on a lined baking sheet. The dough may crack when you pick it up but just gently press it back together, the cracks will not show after it is baked. Bake for 10 mins or until the cookies are browned. Keep an eye on them, they burn quickly after they are ready. They will be soft when you first remove them from the oven, so either leave them on the baking sheet (as long as it is lined with baking paper), or slide them gently on to a wire rack to cool completely. Prepare the royal icing 'cement'; use half the ingredients, 1 egg white, and beat with an electric mixer until it reaches soft peaks, continue beating while gradually adding 1.5 cups of the icing sugar. The mixture should become stiff and shiny. This icing will be used for the construction of the houses, keep the other half of the ingredients for decorating the exteriors. Construct the base of the house by sticking the four wall pieces together as shown below. You could be super neat and use a piping bag to place the royal icing along each side edge of the pieces, but I was lazy and just dipped both sides of each biscuit into the icing and stuck them together. 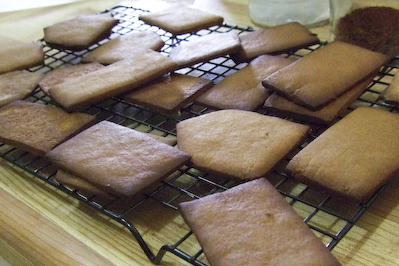 Place on a sheet of foil or baking paper to let the icing harden. When it is set enough that you can gently pick up the whole base without it collapsing, use a spoon or piping bag to spread icing over all the top edges of the base and cement the roof to the top. 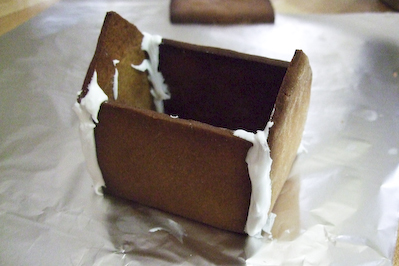 Use more icing to join the two roof pieces together at the very top. You now have your basic house ready for decorating, set it aside to set for about 20-30 mins, and construct all your other houses. Now the fun part, the decorating. You can do whatever you want here, but I'll tell you what I did in case you're curious. I first made up more royal icing with the leftover eggwhite and 1.5 cups of icing sugar I had left, and used that to stick windows and doors onto the walls of the houses. 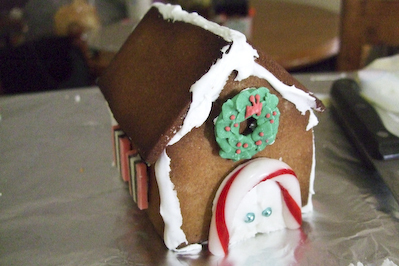 I used licorice allsorts for the windows, and the curved tops of candy canes for the doors. Some of the houses I used malt sticks to look like log walls. I was also lucky enough to snag some pretty Christmas sugar decorations that I could stick on. 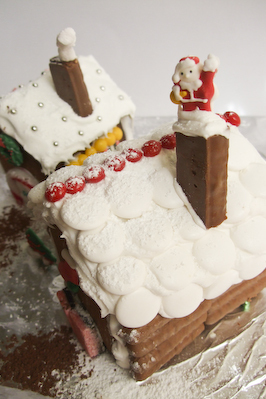 The ones that didn't have plain roofs, I covered with icing sugar and then used flat peppermint lollies as white roof tiles. 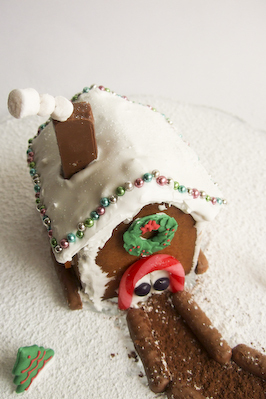 You could also use your leftover scraps of gingerbread cookie dough to make little gingerbread tiles to stick into the roof. 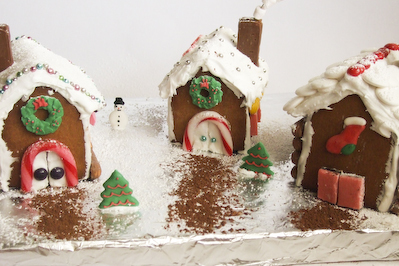 I then placed my houses on a flat board or cake stand, covered with foil and dusted with lots of icing sugar or flour for 'snow' and then cemented the houses to the bottom with more royal icing. A little bit of cocoa powder worked great as a cleared dirth path in the white snow. These gingerbread houses should last at least a week, if you can stop yourself from nibbling on them! Once built, are the structures sturdy? You dont know how excited I was when I saw this post! I sent you an email! I love what you've done!!!! Trissa - Heehee you crack me up Trissa :) Thanks so much!! aw those houses are so cute love your marshmallow smoke! Oh this is so cute! Reminds me of the annual gingerbread house making sessions I had with my friend and her German husband when they were still in Sydney. But ours were so amateurish compared to yours! Your houses are so adorable and must have been soooo fun to make! I will have to be more organised next year and give these a go. Aww these are absolutely adorable! They look like they've come out of a magazine, so pro! I love the decorations and everything! I don't think I'd have the heart to eat these cute little houses either! Great work Steph!! Now that's the kinda house I want to live in! lol. We made gingerbread houses one year, but the whole construction process required infinite patience, especially when all I wanted to do was decorate! The wreaths are a gorgeous touch and I love the candycane doorframe! awesome steph!! loving the snow on top of the roof, makes me yearn for a wintery christmas. Aww Steph! You are amazing! I love the marshmallow chimney smoke! So did you and A eat it all? Ok Steph these are the cutest gingerbread houses I've ever seen!!! I'm so making these for Christmas! The marshmallows as a puff of smoke is an awesome idea :) Nice work! Wow it's a little gingerbread village! Those are seriously some of the cutest designed gingerbread houses I have ever seen, LOVE the marshmallows as the smoke plumes coming out of the chimney! This is so cute! I love the smoke - so creative! I love love love all your creations. The memorable pupcakes and now... OMG the cutest chimny I have ever seen. Love the use of candy canes. Audax would be very very proud. Ooohh you're so talented, Steph!!!!! They're all too cute! Steph, these are sooooo cute! your final touches are so creative. 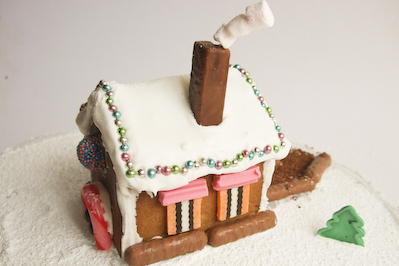 i especially love the marshmallow chimney and candy cane door frame! Oh, how adorable! I've been planning to make a house too, you've definitely given me some inspiration! These look so cute! Though in the photos they don't look so mini! I love the wreath you made! Great decorations! Oh dear, I don't know where I went wrong, but I simply doubled the recipe and was left with a big bowl full of crumbly, useless batter. It won't even gather into a ball. I've gone over the ingredients about 12 times and have left nothing out. Too bad. I love Enid Blyton. Wouldn't it be nice to try a toffee shock! 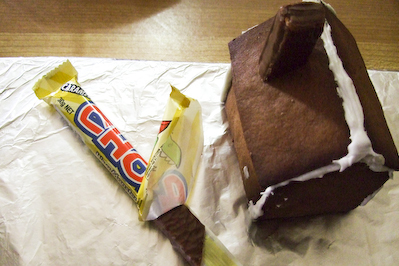 Your little houses are really cute, especially the chocolate chimneys. You are such a clever cookie! How adorably cute are these?!? I love them to bits!!!!! 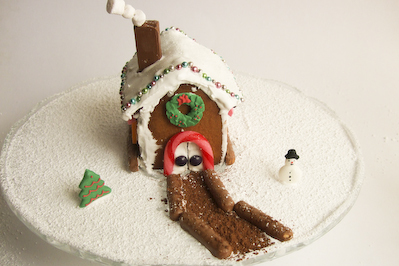 How wonderful are your wee gingerbread houses? Love them! I finished off making my first ever gingerbread house last night and now I wish I'd made wee ones and had a whole village instead. i'm the same when it comes to x'mas baking. I make big plans to start early and before I know it it's already the week or two before x'mas and i haven't done anything! 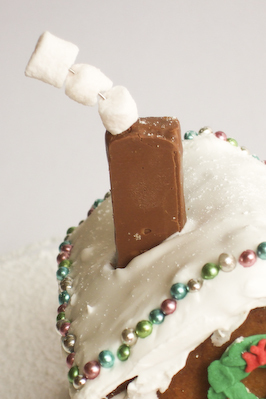 tops to these adorable gingerbread houses! chocolatesuze - I'm a bit in love with the marshmallow smoke, I want to use it on everything! Belle - Oh thank you! Yes give them a go sometime, they are super easy! Betty - Aww Betty you are too kind! I still haven't touched them, I can't bear to! Helen - Hahaha yes how awesome would it be?? Yeah it's a little frustrating, that's why these little ones are quicker and you get to spend less time constructing and more time decorating! Conor - Hehe I know, we had so much leftover candy, I felt sick! mademoiselle délicieuse - trust me, mine are still sitting in my living room untouched! Jacq - Heehee thank you!! Yayay make them! Jenn - Thanks so much! I wish I could have had time to make a whole village, that would have been cool! Anita - Thank you so much! SadieandLance - Yay I love it when I lure out non-commenters! :D Well it's been pretty warm in Sydney recently, and after about a week and a half the houses are still as firm as the day I made them! I'm keeping them in the shade in my living room, not sure how they'd fair in the sun though. Y - Thank you :D Mini marshmallows are the best! Jen - Hehe thank you :) I knew what you meant! Chris - Yay can't wait to see yours! Rilsta - Yeah the photos are quite close, but you can tell from the dimensions that they were teeny! Thank you! Arwen from Hoglet K - Yay good to find another enid fan :D thank you! Chele - hehe thats the best way to describe them, they are wee! Ooh congrats :) I bet yours was great! panda - I'm still so far behind on my xmas shopping, time just flies by! Hi Cheri, sure go ahead! :D thanks for asking! Steph, your houses are such so darn cute! I love it. Amazing you didn't have to use a template! Julia - Thank you so much! Hehe yeah it was sort of trial and error until I got a size that I liked! Cheri - :) You're very welcome! Very cute! I've got to use your marshmallow smoke puffs on my house next year. just love all the details and adore this cute little perfect looking houses. amazing work with this challenge. Maggie - Thanks so much! Hehe aren't the smoke puffs the best bit? MandyM - Thank you! I think the smoke is my favourite thing, definitely doing it in all my gingerbread houses from now on!